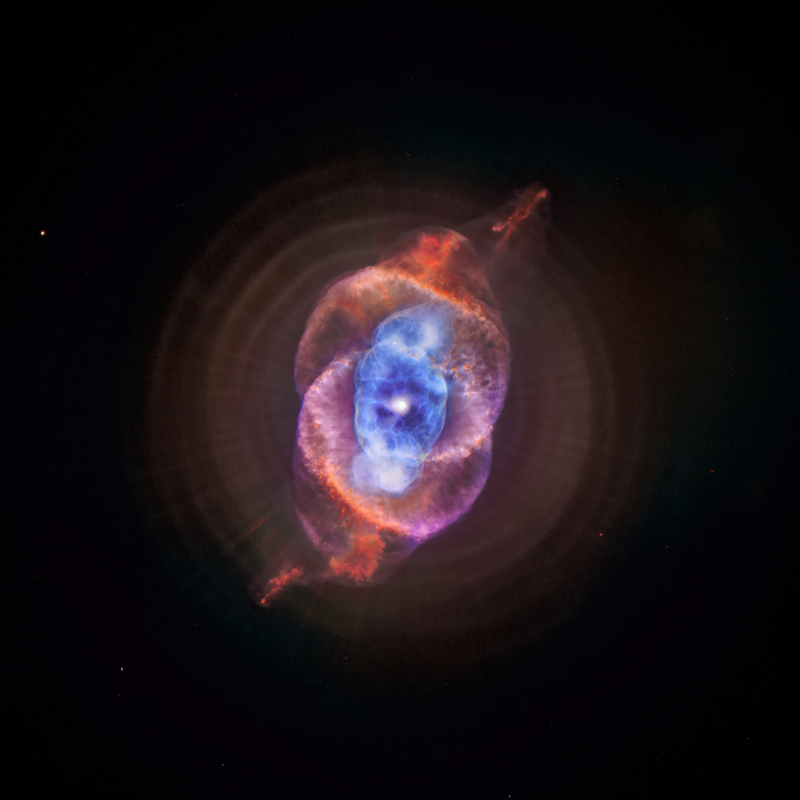 This composite of data from NASA's Chandra X-ray Observatory and Hubble Space Telescope is a new look for NGC 6543, better known as the Cat's Eye nebula. This famous object is a so-called planetary nebula that represents a phase of stellar evolution that the Sun should experience several billion years from now. When a star like the Sun begins to run out of fuel, it becomes what is known as a red giant. In this phase, a star sheds some of its outer layers, eventually leaving behind a hot core that collapses to form a dense white dwarf star. A fast wind emanating from the hot core rams into the ejected atmosphere, pushes it outward, and creates the graceful filamentary structures seen with optical telescopes. Chandra's X-ray data (colored in blue) of NGC 6543 shows that its central star is surrounded by a cloud of multi-million-degree gas. By comparing where the X-rays lie in relation to the structures seen in optical light by Hubble (red and purple), astronomers were able to deduce that the chemical abundances in the region of hot gas were like those in the wind from the central star and different from the outer cooler material. In the case of the Cat's Eye, material shed by the star is flying away at a speed of about 4 million miles per hour. The star itself is expected to collapse to become a white dwarf star in a few million years. Always my favorite nebula, thanks to infinity. So wonderful. Thank you for posting these.